The stiff, starched linen. The tasteful use of purple orchids on tabletops and garnishes. The soft, soothing sound of traditional Thai music played on a khim (dulcimer) by an actual Thai musician in a corner. The fine benjarong (hand-painted bone china; from which this restaurant is also named after). All red flags signaling a meal here probably isn’t going to be too budget-friendly. Benjarong Royal Thai Restaurant is the Thai restaurant of the Dusit Thani Manila which specializes in Royal Thai cuisine. This regional style of cooking originates from Central Thailand and was only meant for royal court and families but has been made available of late to the public. Basically it’s a mix of the fiery Northern cuisine and the South’s profuse use of coconut milk. And while Thai home-style cooking focuses on the balance of the taste of food itself, Royal Thai cuisine basically ups it a little with emphasis on aesthetics as well. However I wasn’t here for all the frou-frou. I’d be happy to eat with my hands, seated over gutters as long as the food was worth it. This place just happens to be the place to get proper Thai food when in Manila. True there are a handful of good ones in the Makati/Taguig area alone. But I feel Benjarong still gives the best value amidst the competition in terms of the quality, portions and uncompromising authenticity of ingredients and preparation. And yes, the food tastes great. As if I were in a “proper” restaurant back in Bangkok. For this lunch we had Miang Takhrai Krathong Thong to start. Tuna, lemongrass, dried shrimp, shallots, lemon and chili in crisp pastry cups. Flavorful, aromatic with just that tiny bit of heat to kick-start the palate. Almost too pretty to eat. Just as with Filipino meals, wherein the soup and other viands are eaten with rice at the same time, our mains arrive altogether. We had Tom Yum Talay perfectly cooked mixed seafood in a pleasantly mild sour broth. The Phad Phak Kana Pla Kem, or wok-fried but still crunchy kailan with flaked fried salted fish, is a Chinese influenced dish with a smoky flavor imparted by the high heat cooking. The Gaeng Phed Moo or red pork curry with coconut milk was actually a second choice after the unavailable massaman beef curry (a “dry” red curry) but was excellent as well. The gravy alone was good enough to eat spooned over fragrant jasmine rice. 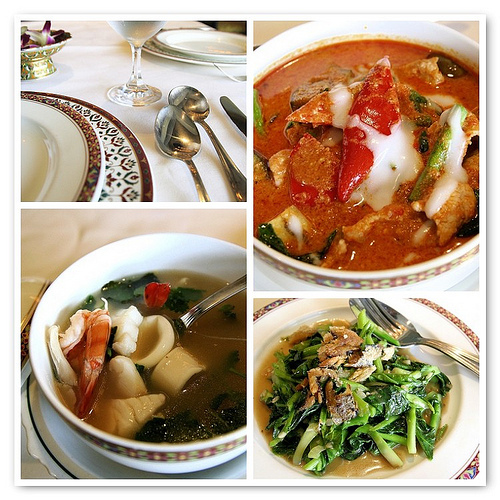 The key to ordering Thai food is to balance out tastes across several dishes; textures from crispy to creamy, flavors ranging from delicate to very spicy. 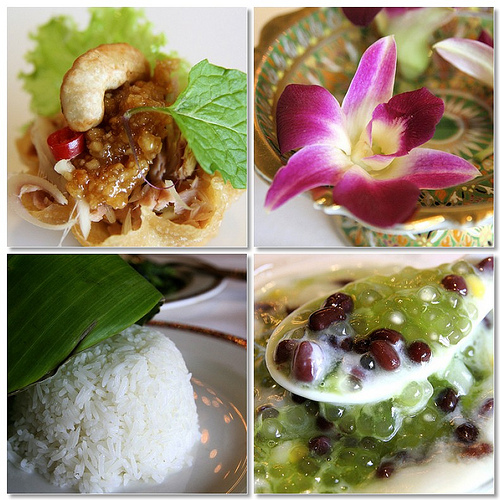 Not all Thai dishes are fiery as some people fear. But given I tend go overboard with the Phrik Nam Pla (condiment made of fish sauce, chili, garlic & manao) its pretty normal for my tongue to be throbbing from the chili burn after a good Thai meal. Dessert always provides the solution. The fat found in coconut cream helps moderate and dilute the capsaicin from the chilies and cool sugar solutions provide relief from the burn. Not surprising that a number of Thai desserts come in form of cool or cold milky liquids. The Sago Thua Dum (pandan scented sago and sweet black beans in coconut milk) provided some tasty reprieve. The sweet sticky soup coated the mouth; the chewy sago and tender beans provided the needed distraction. After finishing my serving the heat was not a problem any more. Yet another satisfying meal at Benjarong. Definitely not the type of place to have meals at regularly but I’ve been to one too many Thai restaurants (or those that try to pass themselves off as one) in the city and have been left with a broken heart AND with a thinner wallet just the same. Not to say I’m unwilling to try other Thai restaurants that’ll come up but if I were to reward myself or celebrate a special occasion I wouldn’t think twice coming here because I know the experience would be worth it. Now if only a price friendlier Isaan (Northern Thai) style grill would open here.